Saturn never ceases to amaze, it has the famous rings, a moon with methane lakes and another satellite with water geysers. 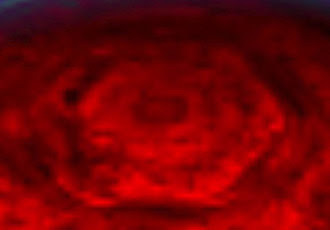 The latest astounding discovery is a hexagon feature at its north pole. From NASA. No one has much of an idea of whats causing the feature and the sensible thing to do is to wait for more information. However I doubt we will have to wait long before independent thinkers like Richard Hoagland come up with an explanation, probably involving Hyperdimensional Physics. I'm not sure what hyperdimensional physics is but it sounds good. The alien conspiracy types are just going to love this.